What caused this refractory pruritic eruption? A 67 year-old female presented with greater than 3 years of refractory and debilitating intermittent bouts of recurrent pruritus on the left infrascapular skin in the T5-T6 dermatome and new onset of right arm and shoulder, and low back tingling and small superficial erosions. Skin examination of the right deltoid, lateral upper back, and low back revealed multiple superficial erosions in a very atypical zosteriform pattern. Orthopedic examination confirmed moderate spinal scoliosis, marked decreased range of motion in the neck with associated marked bilateral cervical muscle spasm and tenderness to palpation, particularly on the left side. Past medical history of the patient was significant for rheumatoid arthritis (RA), hepatitis C, borderline anemia of chronic disease, and iron deficiency. Pertinent history included 2 years status post multiple mild-moderate automobile related whiplash injuries with subsequent intermittent interscapular and neck pain. Past treatments for neck and back pain included frequent spinal adjustments, physical therapy, trigger point injections, paravertebral ganglion blocks with a pain specialist, and various other failed medical treatments including oral gabapentin and muscle relaxants. Diagnosis: Refractory Concurrent Atypical Notalgia Paresthetica (NP) and Brachioradial pruritus (BRP) Associated with Hepatitis C and Rheumatoid Arthritis. 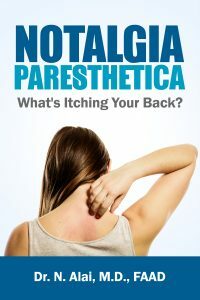 Notalgia paresthetica (NP) and Brachioradial Pruritus (BRP) are heavily under-recognized and under-diagnosed common causes of episodic and chronic, localized, dysesthesias and itching of the mid back and upper extremities respectively (1, 2). While NP and BRP are often described as independent conditions, these two conditions do often occur concurrently or serially in the same individual (2). Typically, NP presents with a hyperpigmented patch or plaque in the infralateral scapula while BRP presents as symptomatic periodic dysesthesias accompanied by mild erythema or excoriations on the affected forearm(s). An atypical dermatomal distribution of superficial skin erosions can mimic Herpes Zoster. Negative viral laboratory testing, infectious disease consultation, and failed treatment with oral valacyclovir excluded a viral infectious etiology for our patient. Histopathologic examination of the involved back and arm skin biopsies demonstrated nonspecific findings of superficial and perivascular dermal inflammation with mild, focal secondary impetiginization. The differential diagnosis for NP includes irritant dermatitis, contact dermatitis, lichen simplex, neurodermatitis, lichen amyloid, bra strap dermatitis, and others. Although BRP and NP have long been considered dermatologic conditions, both are more accurately described as sensory neuropathies (1-4). NP and BRP may in fact represent the same spectrum of one pathophysiologic neuropathic disorder originating from the cervical spinal region (2). Both NP and BRP’s well described associations with underlying cervical musculoskeletal disease in many patients warrants categorization of these disorders as a primary neuropathy with cutaneous manifestations (1,2). Similar to prognostication of standard cervical musculoskeletal diseases, NP and BRP are generally chronic, controllable conditions with periodic remissions and exacerbations. Collaborative multi-specialty evaluation by dermatology, radiology, neurology, pain management, acupuncture, physical therapy and orthopedics surgery may be indicated in best practices of management of these 2 conditions (1,2). First line therapy for NP and BRP with associated cervical disease should include consideration of potential non-dermatologic therapies aimed at the spine. Such cervical spinal treatments include transcutaneous electrical stimulation (TENS), acupuncture, electrical muscle stimulation (EMS), cervical traction, spinal manipulation, physical therapy, massage, cervical muscle strengthening and range of motion enhancing routines, neck passive continuous motion (PCM), oral non-steroidal anti-inflammatory medications, and oral and topical muscle relaxants. NP and BRP may both in fact dermatologic signs of underlying systemic disease (1-4). A paradigm shift in the dermatologist’s approach to treatment of NP and BRP is warranted, with a focus on eliciting relevant spinal history including cervical muscle spasm, neck trauma, arthritis, degenerative disk disease, and other spinal neoplasms (1,2). Topical therapies for NP and BRP have been highly inconsistent and unsatisfactory in a majority of patients (1-4). Further, appropriate patient education for both BRP and NP requires discussion of potential cervical conditions and clear awareness of the probable association of the localized itching with underlying cervical disease (2). Radiographic studies of the cervical spine including plain film and MRI may be more considered in primary evaluation of both NP and BRP than current standards. We describe a concurrent case of refractory NP and BRP in a 67 year-old female successfully controlled with cervical musculoskeletal disease management. Skin lesions in this patient cleared using our newly standardized multimodal therapy program for NP and BRP utilizing a customized clearing and maintenance phase schedule directed at cervical spinal and disc disease at C4-C6. The main components of this program utilized in office and at-home TENS and EMS, cervical acupuncture, phototherapy with Narrow band ultraviolet B (NB UVB) for generalized pruritus control, physical therapy referral, and consultation with Rheumatology and Pain Management. Patient was doing very well dermatologically at a 3 year follow up. 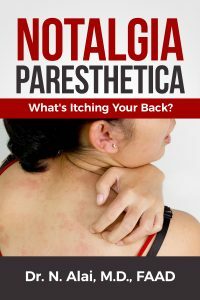 Notalgia paresthetica (NP) and Brachioradial Pruritus (BR) are not true dermatologic disorders, but rather cutaneous signs of underlying systemic disease (1-5). NP and BRP are predominantly associated with varying degrees of cervical muscoskeletal disease ranging from asymptomatic and extremely mild cervical muscle spasm, to severe spinal stenosis and cord impingement at C4-C6 with corresponding upper extremity radiculopathy. The striking association of NP and BRP with degenerative or traumatic cervico-thoracic spine disease suggests that cervical arthropathy or maylagia often contribute to the pathogenesis of these skin symptoms of both diseases (1-5). Additional studies are needed to further assess the relationship of NP and BRP with cervical spine disease and comorbidities predisposing certain individuals to developing these dermatologic manifestations. The most successful treatments for these neurocutaneous diseases center around treating the cervical pathology first (2). We propose that the new rule in NP and BRP is to treat the neck, and the skin will follow. While topical therapies have historically been utilized as first line therapy in NP and BRP, we also propose a best practices paradigm shift in the global assessment and approach to these diseases with therapies aimed at the cervical region. Broader scope spinal evaluation and systemic laboratory and imaging evaluation for underlying causes of pruritus may be warranted to fully evaluate refractory the underlying causes. Cervical spinal imaging and treatment may be appropriate as primary or first line therapy in many cases of refractory NP and BRP. Figure 1. Zosteriform erosions on the right deltoid and lateral scapular region. Figure 2. Zosteriform erosions with crust on the left low back, but noted to cross midline. Figure 3. Hyperpigmented, lichenified, pink plaque left low back with small erosions and excoriations. Figure 4. Patient’s MRI demonstrated osteophytes, arthropathy, and cervical disc disease at C4-C6.